The original scientific team that developed Bikanta’s innovative nanodiamond technology, including Drs. Keir Neuman, Susanta Sarkar, and Ambika Bumb, was recognized with the Orloff Award this year. The Technical Orloff presented for the first time, was for “The Development of Wide-Field In Vivo Background Free Imaging via Magnetic Modulation of Fluorescent Nanodiamond Emission”. 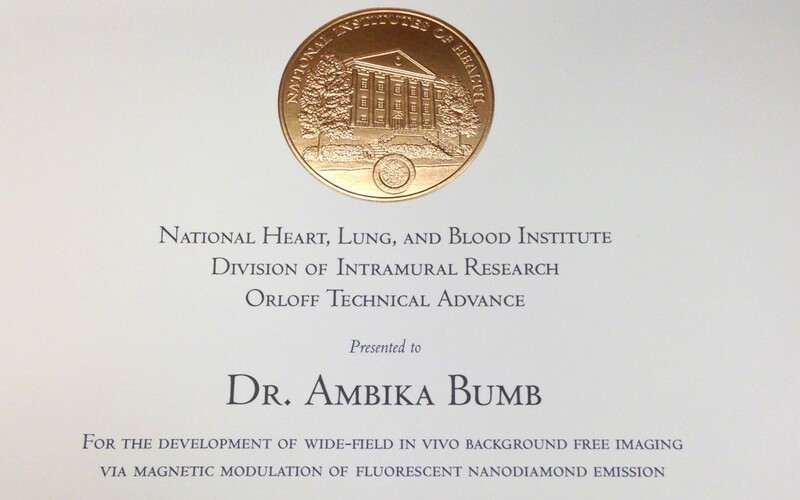 Along with the Scientific Orloff, these awards were created by the National Heart Lung and Blood Institute (NHLBI) as an annual award to recognize outstanding research teams that are moving forward the Institute’s vision and mission. NHLBI is the third largest Institute of the National Institutes of Health, with a budget of ~$3.0 billion a year for advancing the understanding of the development and progression, diagnosis, treatment, and prevention of disease, along with the reduction of health care disparities within the American population and advancing the effectiveness of the U.S. medical system. Needless to say, Bikanta is appreciative NHLBI’s recognition and support of its technology. The awards are named in honor of Jack Orloff, scientific director (from 1974-1988) and longtime member of the NHLBI intramural family.